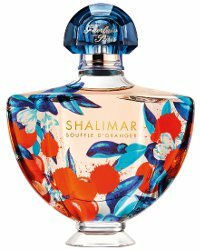 Guerlain has launched Shalimar Souffle d'Oranger, a new fragrance for women. Shalimar Souffle d'Oranger is a flanker to 2014's Shalimar Souffle de Parfum, which was a flanker to 1925's Shalimar. Shalimar Souffle d'Oranger is intended as an 'homage' to orange blossom; additional notes for the floriental fragrance include petitgrain, mandarin, bergamot, neroli, jasmine, sandalwood and vanilla. It was developed by Guerlain house perfumer Thierry Wasser. Guerlain Shalimar Souffle d'Oranger is available in 50 ml Eau de Parfum. Always wonder if the special bottles look as nice IRL as they do onscreen. Yeah. I did like the peacock one much better but never saw that in person either. Thank you! And FragranceNet has it very cheap! But I do not like the Souffle. Great bottle! I like Shalimar Souffle. I never tried it’s flankers though. Excited to try this one!! Speaking of pretty bottles, has anyone seen this Elie Saab in person? I will blind buy this in a heartbeat if I could just figure out where! I don’t think it’s released yet? I find the flankers difficult to track down in the US (see: Souffle de Lumiere). If anyone sees it in RL, let me know! They are tough to find, and if you really want one I would get Shop France to mule you one from Paris. I think her prices are pretty reasonable. She sells on eBay and if you write her, she will add you to her mailing list and you’ll know next time she’s going overseas. Too funny! I just discovered her shop looking at the Souffle de Lumiere (should d’Oranger not pan out). Just dropped her a note, fingers crossed!! Hi, can you give me the exact user name of this shop France person on ebay? I put in a bunch of variations of that name in the advanced search on ebay and came up with nothing. I’m dying to get this fragrance and was told my someone that it might not get to this country until late 2020. I’d really appreciate it. Thanks. I just wanted to add that I have had only great experiences with Shop France on eBay. She is very responsive if you have any questions also and ships super fast. How did you make out? Is she able to buy it for you?